The Inter-Parliamentary Union was created in 1889, in an era when there were no established means for governments, parliaments or MPs to work together internationally. It took two 19th century men of vision—Englishman William Randal Cremer and Frenchman Frédéric Passy—to lay the foundations for all that has followed. They set up an association of MPs which has been transformed into the thriving global organization of today. The men were from vastly different social backgrounds, but were united in their belief in solving international disputes through peaceful means. Lifelong, tireless campaigners for peace, both went on to win the Nobel Peace Prize—along with six other IPU figures. Their work led to the world’s first permanent international political organization and provided the origins for multilateral cooperation between nations today. 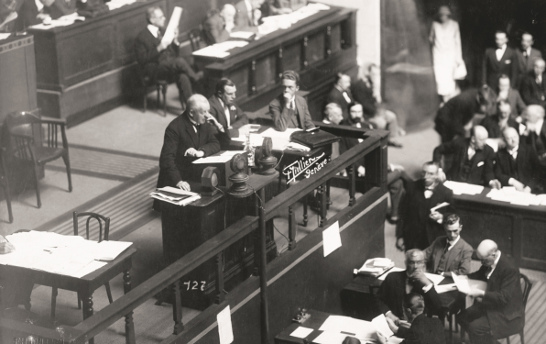 The IPU was instrumental in setting up the Permanent Court of Arbitration in The Hague in 1899, and its calls for an international institution linking governments helped lay the foundations for the creation of the League of Nations in 1919 and the United Nations in 1945. The idea of bringing together MPs from different countries had been gaining ground among pacifists in the 1870s and 80s, but until 1889 no one had seized the initiative to turn the idea into a reality. Cremer had been born into poverty in England, working as a carpenter and trade union leader before becoming an MP in 1885. Passy was from a wealthy and influential French family, and was a respected economist. They were working separately in their own countries to promote arbitration between nations, before joining forces across the social and national divides that separated them. Cremer had persuaded 234 of his fellow MPs to sign a document proposing an arbitration treaty with the United States. He headed a delegation which crossed the Atlantic and presented it to US President Grover Cleveland. The treaty was not approved by Congress, but the visit triggered a barrage of support for the notion of arbitration, and in June 1888 the US Senate adopted a proposal to enter into arbitration over disputes with other governments whenever possible. Around the same time, Passy put forward a motion calling on his own government to seize every opportunity to settle international conflicts by mediation and arbitration. Cremer heard about the Frenchman's actions, and wrote to him suggesting they met to exchange views. Cremer said he could bring 200 British MPs to Paris if they were invited to a meeting. Passy issued the invitation, telling Cremer that if he brought only half a dozen MPs it would be a great event. The historic meeting was organized at the Grand Hotel in Paris on 31 October 1888. In the event only 9 British MPs crossed the Channel and joined 25 of their French counterparts at the meeting. Passy opened proceedings and was elected President, while Cremer and Sir George Campbell became Vice-Presidents. The meeting concluded that a treaty of arbitration between France and the United States was far more likely to succeed than a treaty between Britain and the United States, due to disputes over Ireland and Canada. Keen to continue their work and far from discouraged by the low attendance, the MPs arranged to meet the following year. Crucially, they decided to invite MPs sympathetic to the cause of arbitration from parliaments around the world, opening the doors to serious international conferences for the first time. 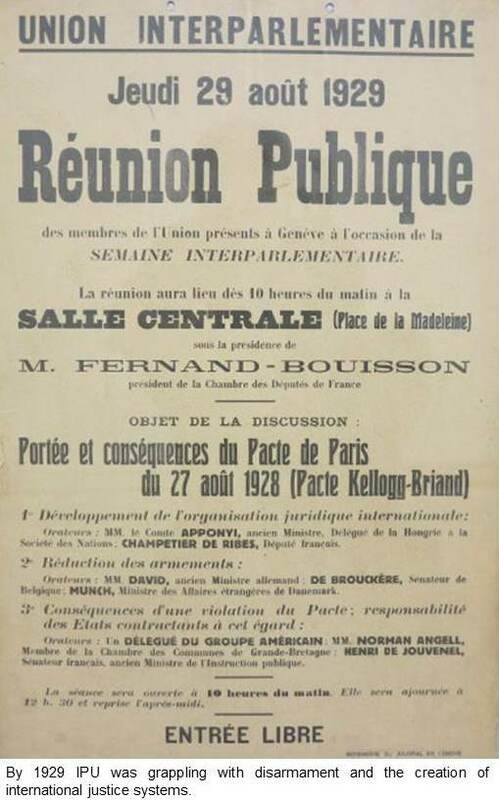 A committee was set up to organize a conference in Paris on 29 and 30 June 1889, to coincide with the World Exhibition. When Cremer visited the modest hall chosen as the venue a few days before the conference began, he was appalled and felt it was a poor match for the grandeur of the occasion. He rushed out and booked the Hotel Continental—home to one of the most beautiful auditoriums in Paris. This time the meeting was attended by 55 French and 28 British MPs, as well as 5 Italians and 1 representative each from the parliaments of Belgium, Denmark, Hungary, Liberia, Spain and the United States. Although the global contingent was small, it was enough to give the Conference an international character. On the second day, the MPs decided the meeting should take place every year. The Inter-Parliamentary Conference—later called the Inter-Parliamentary Union—had officially been born on 30 June 1889. Passy was elected President and Cremer Vice-President. Three years later, the group set up its headquarters, the Inter-Parliamentary Bureau, at Berne in Switzerland, with Albert Gobat (who went on to win the second Nobel Peace Prize) acting as voluntary Secretary General until 1909. It was Cremer who initiated the process by which Christian Lange became the first paid Secretary General, from 1909 until 1932, and the organization was placed on a firmer footing financially by Andrew Carnegie. The organization adopted its current name—the Inter-Parliamentary Union—in 1899.